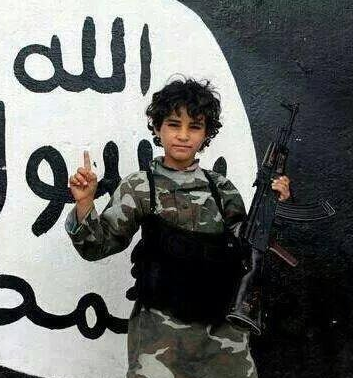 Left: A nine year-old soldier joined ISIS in Iraq. That, however, should have come as no surprise for to the U.N., the media, or anyone following Palestinian indoctrination of children to jihad against Israel, especially after the Palestinian Authority was formed in 1994. The Quillian report noted with worry that there are 31,000 pregnancies in the ISIS-controlled territories. But generations of Palestinians children have been fed a steady jihad, beginning in their mothers’ wombs. The United Nations Relief and Works Agency (UNRWA) runs 252 school in Gaza, serving more than 240,000 children. The majority of the teachers in these schools are members of Hamas, which the U.N. has failed to designate as a terrorist group. the textbooks, provided under UNRWA’s watchful eye, are saturated with anti-Israeli and anti-Semitic propaganda, their schools serve to hide rockets and other weapons, and the children summers are spent in jihad training camps. 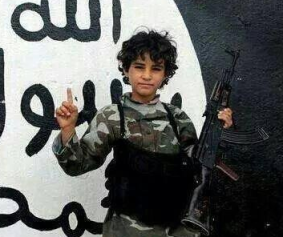 The success of Palestinian jihadi indoctrination has been reaffirmed by ISIS, which chose to emulate the system. Could UNRWA be far behind?